I think it’s fair to say that spring is my favorite time of year, especially living in Texas. Not only is the weather (mostly) perfect for a few months, with spring comes crawfish boils, outdoor festivals, and Easter. 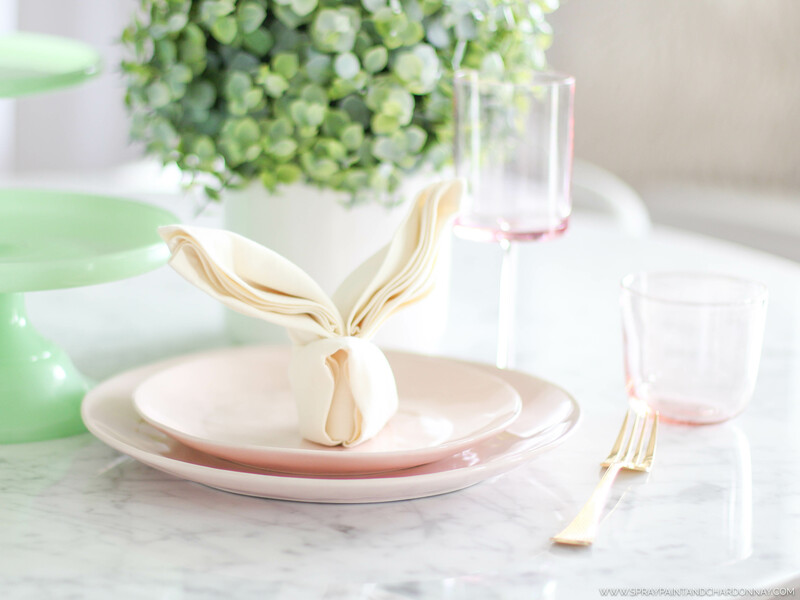 And as much as I love decorating and entertaining for a holiday, I realized I’ve never actually done an Easter entertaining post! That ends today! I always like to remind people that entertaining, no matter the occasion, does NOT have to be stressful — or expensive! Whether you’re hosting the whole family or just your girlfriends for a Bunny Brunch, here are a few simple, budget-friendly ideas to make your Easter gathering egg-cellent! Be sure to scroll to the bottom of the post to shop the looks + some great serving pieces that are easy on the wallet. If you’re too busy preparing for guests to fold a bundle of little bunny napkins, this would be a great project for the tweens or teens in the family! Granted this idea is not ground-breaking (or original…Thanks, Pinterest! ), but it’s so darn cute! 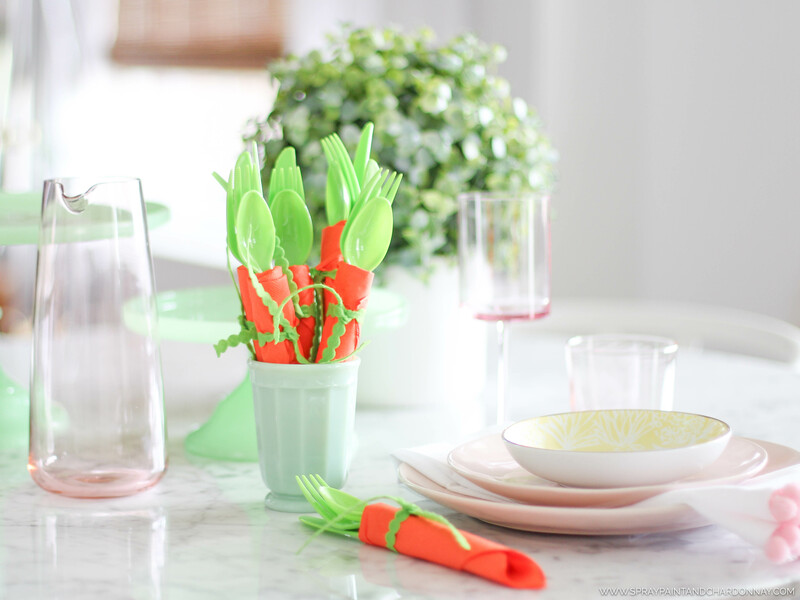 Simply wrap green plastic-ware with an orange paper napkin, tie it off with some string, and voila! I laid my napkins out like a diamond and folded the top corner down about 1/3 of the way before rolling to make it look more carrot-like. 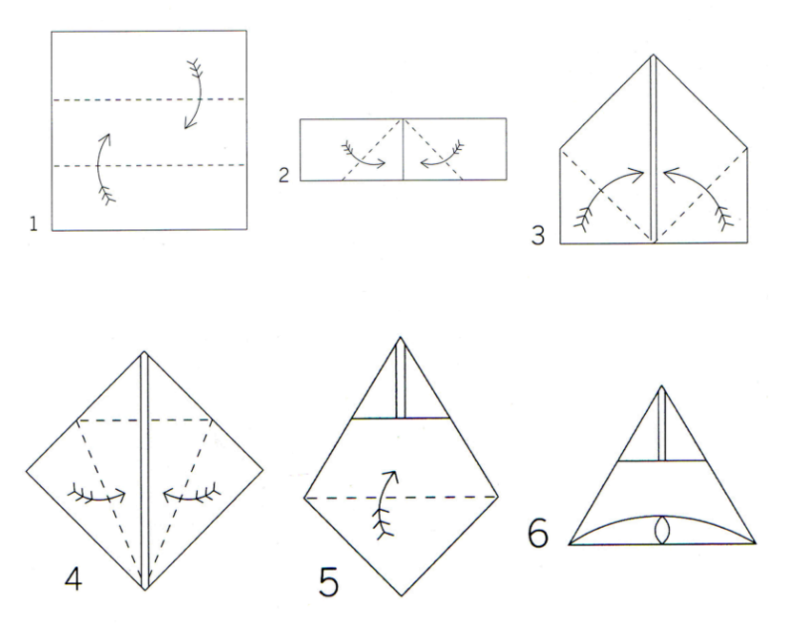 Again, this would be a great assignment for kids while you’re cooking or setting the table. Pom-pom fringe can be found at almost any craft store, and I used some plain white linen napkins I already had at home. While I used hot glue, you could also use fabric glue for a more permanent detail. 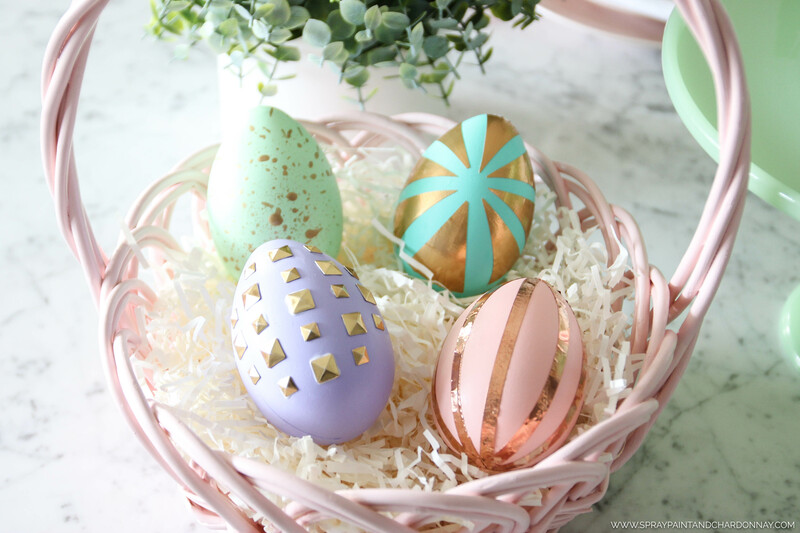 To put a fun, modern spin on my Easter eggs this year, I took a page from my own book and resorted back to some of my old tried & true pumpkin decorating ideas. Just like I love to use faux pumpkins for fall, I used faux, craft eggs for these — and they’re great! No boiling required, and they’ll never go bad! 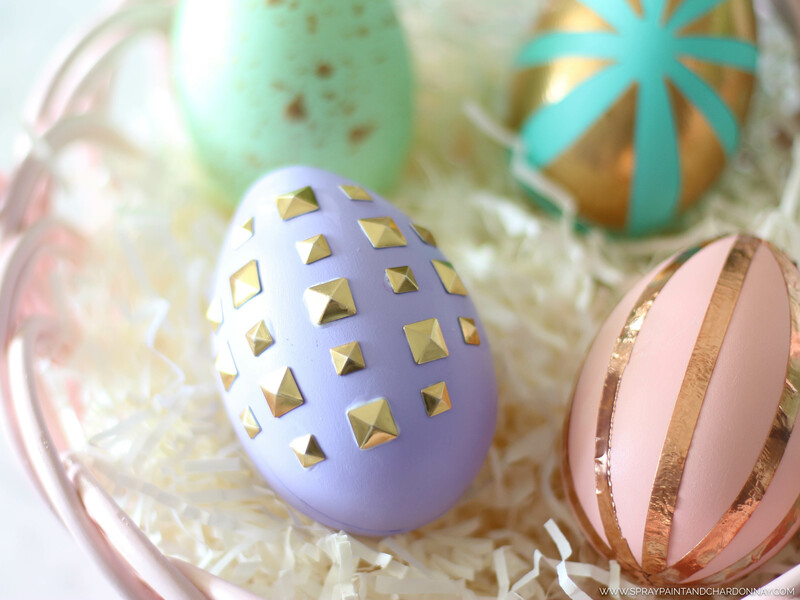 My studded pumpkin DIY is one of my most popular DIYs to date (and a personal favorite), so why not make my Easter eggs as equally studly?! I simply painted the egg with some acrylic paint, let it dry, and then added gold studs using good ol’ Elmer’s glue. Again, using acrylic paint, I painted the egg a solid color and let it dry. Once dry, I watered down some gold acrylic paint and using a dry paint brush, I flicked the paint on to the egg for a splatter-painted, speckled effect. Duct tape makes everything better! I followed the same technique on this egg as I did on my duct tape pumpkin. I’ve always adored this pumpkin decorating idea, so I tried it on an egg — and it’s equally awesome! Copper tape can be found here. I recently shared these ideas on KXAN’s Studio512, so click below to view the segment! And I’ll repeat it once more — entertaining doesn’t mean you have to break the bank! Retailers like World Market, IKEA, and my beloved HomeGoods have amazing entertaining pieces at incredible prices that can be used throughout the year for various occasions. Shop some of my picks below!